Metric Insights instances are configured with the top 20 currencies in use worldwide. If other currency symbols are required, these may be added whenever Dimension Value is created or edited. A Currency Prefix may be a symbol or a phrase. A Dimension must be configured to allow a Currency Prefix to be associated with an individual Dimension Value. See Set a Currency Prefix for Dimension Values for more details. 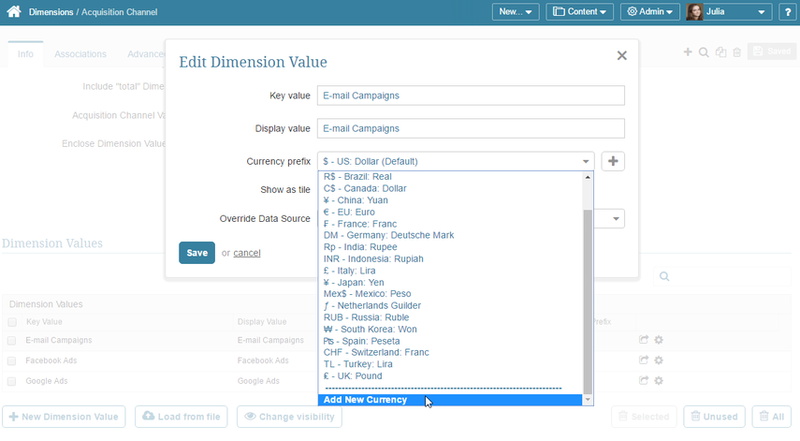 Move to the bottom of the Currency Prefix drop-down list and select the Add New Currency option.